Golden Gate cloning-based assembly of constructs for CRISPR genome editing in dicotyledonous plants. Please Note: Plasmids pDGE144-169 are not functional for genome editing in Arabidopsis thaliana. The Stuttmann lab has more recent vectors providing improved efficiencies and/or selection markers, which may be obtained by directly contacting Johannes Stuttmann ([email protected]). Generation of chromosomal deletions in dicotyledonous plants employing a user-friendly genome editing toolkit. Ordon J, Gantner J, Kemna J, Schwalgun L, Reschke M, Streubel J, Boch J, Stuttmann J. Plant J. 2016 Aug 31. doi: 10.1111/tpj.13319. [Epub ahead of print] PubMed PMID: 27579989. This collection was designed for the simple Golden Gate cloning-based assembly of constructs for genome editing in dicotyledonous plants. The collection consists of “genome editing recipient” and “sgRNA shuttle” vectors, respectively. 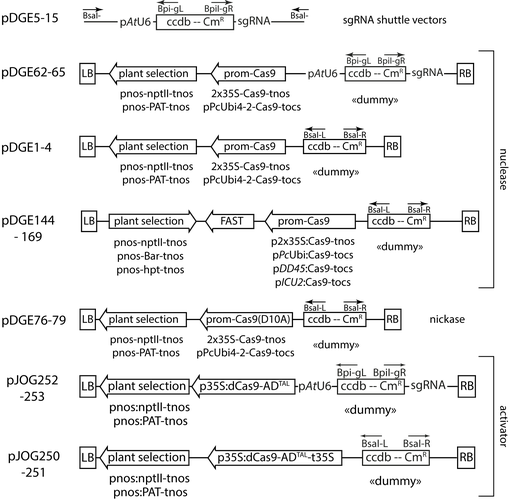 Recipient vectors are Agrobacterium-compatible, and contain a Cas9 expression cassette, a plant-selectable marker and a /ccdB/ cassette as a “dummy”. Shuttle vectors allow the generation of sgRNA transcriptional units from annealed oligonucleotides. sgRNA transcriptional units are then mobilized into recipient vectors, replacing the /ccdB/ dummy. The Modular Cloning Toolkit (Addgene #1000000044), Modular Cloning Plant Parts (Addgene #1000000047) and hCas9 modules (Addgene #49771 and #49770) provided by Sylvestre Marillonnet, Nicola Patron and Sophien Kamoun, respectively, were used in construction of pDGE/pJOG plasmids. Summary of plasmid design schemes. Dissection of TALE-dependent gene activation reveals that they induce transcription cooperatively and in both orientations. Streubel J, Baum H, Grau J, Stuttmann J, Boch J. PLoS One. 2017 Mar 16. doi: 10.1371/journal.pone.0173580. PubMed PMID: 28301511.